Making our way through eager rafters at Dennis Oliphant’s Sun Country Tours this morning was just the first phase of an energy-filled chat. Dennis hails from a watery youth spent on and around the Columbia River. His daily routine varied by seasons from tracking water fowl to sailing Lasers, Hobie Cats and Sunfish. After graduating from the University of Oregon Dennis moved to Bend in 1977 with his eye on guiding white-water trips. Hard work and ambition, along with a passion for what you do usually leads to the start of a great business. Almost as a one-man band, in 1978 Dennis ran Sun Country Tours. Expanding his interests in all things “watery” he developed, administered and taught the outdoor classes at COCC in the early 80’s. A whirlwind of classes that included river rescue, kayaking, rafting, climbing and snowshoeing did little to dampen Dennis’ love of water sports. By the early 1980’s he’d jumped feet first into the sport of windsurfing. Every day off would find him on a windy lake or in the Gorge. Family vacations were directed to Maui, for more great windsurfing opportunities. In a seamless segue, on the less windy days, Dennis and friends began one more board sport – surfing! From tropical oceans to wake-surfing with family and friends on the lakes of the Central Oregon Cascades Dennis, along with family and friends, continued the quest to spend as much time on the water as possible. The most recent water sport addition to the Oliphant quiver occurred about 6 years ago when family friend, Gerry Lopez, brought a few boards to local Lake Cultus including a few Mickey Munoz tandom surf boards and that was all it took to launch a day of criss-crossing the lake. By late afternoon when the wind filled in they were “surfing” some downwinder swells and they were hooked on SUP! It was pioneer times for a great new sport. Like any new addition to a culture, there were challenges. Prone surfers, especially in crowded areas, were not keen on these big guns ridden by surfers with paddles. Getting the stink-eye at a local surf spot was just the tip of the displeasure. Dennis, and his buddy Gerry Lopez came by a solution by simply doing what they did in life – spreading aloha and respect to others. The early standup surfers, Laird Hamilton and Dave Kalama also modeled the behaviors of safety, respect and aloha that changed attitudes. When all is said and done – why not share, be respectful and work toward doing the right thing. 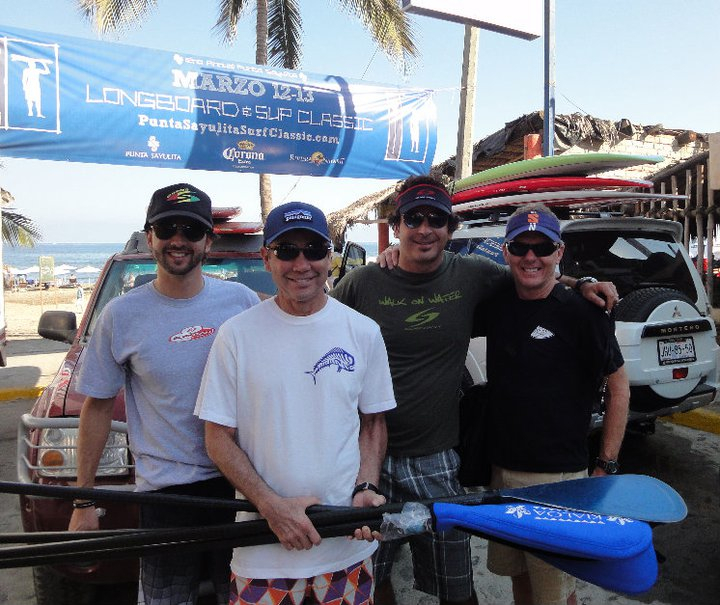 Dennis and Gerry had the opportunity to test the influence of the aloha spirit on an area about a year ago at Dennis’ Punta de Mita (Mexico) Paddle Surf Lifestyle Camp. Beyond engage the locals, answering their questions, giving them space on local breaks, they went a step further by inviting the local families to a Mexican style luau. Pictures of Gerry Lopez were a great hit as well as the local fish grill. Gerry spoke about growing up surfing (the conventional way) and how surfers held great surfers in high regard, from Duke Kahanamoko thru today’s watermen. As different elements of surfing evolved, there was always conflict between the old and the new. Through each phase it was important to develop ways of getting along and sharing aloha on the water. If someone was disrespectful, has challenging as it was, it was important to talk to them – but in a respectful manner. The coolest outcome was that all the way down to the youngest groms – they “got it!” Almost overnight there was a pervasive spirit of aloha both on and off the waves. 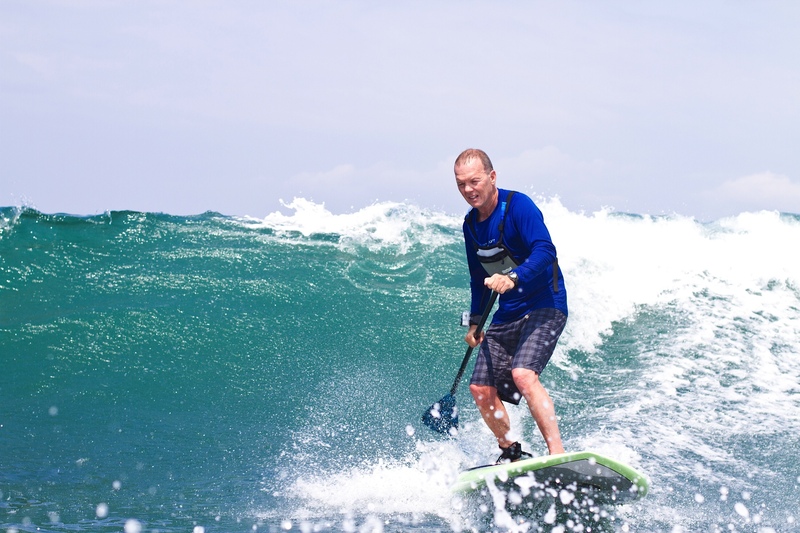 The local surf professionals began to hone their paddle surfing skills and began teaching the new sport with enthusiasm – and respect. That’s what “Elder SUP” is all about – changing attitudes and building a spirit of family and awareness through our favorite water sport. This entry was posted in Hawaii, Journeys and Quests, People and tagged Columbia River by Water Words. Bookmark the permalink.